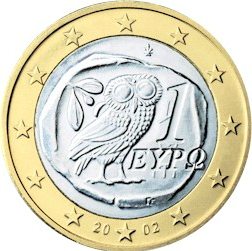 Deflation – The Great Equalizer – Now Greece? Was There a Different TESTED Response in History? YES! Deflation remains a mystery for many because they just cannot grasp the fact that money supply can increase while prices decline. Their heads begin to spin around and they spit out green pea soup because it is not supposed to happen in their mind. During deflationary trends, money supply can still increase but the contraction is so massive that money supply cannot possibly increase at the same pace as assets collapse as demand shrinks into the sunset. 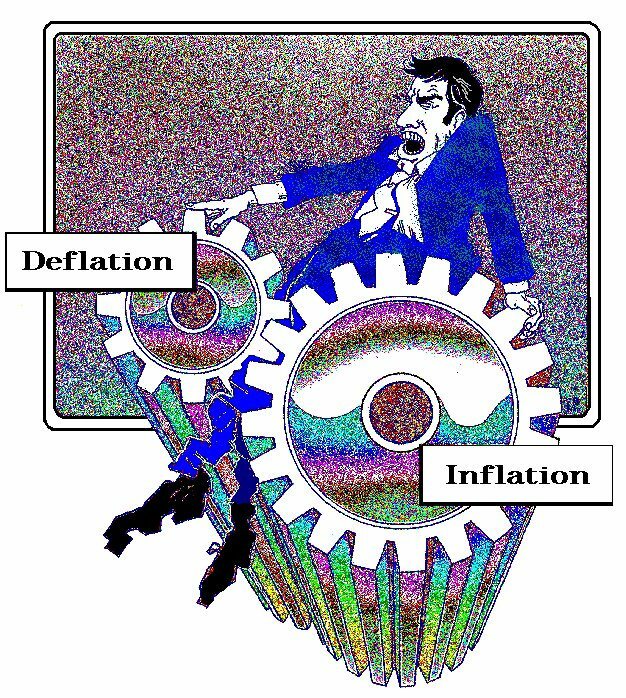 Deflation can emerge from two primary sources – domestic and international. President Grover Cleveland explained his observation during the Panic of 1893 how capital can flee and hoard but labor cannot. Then if taxes rise, capital is consumed by government and that further shrinks the domestic available money supply. 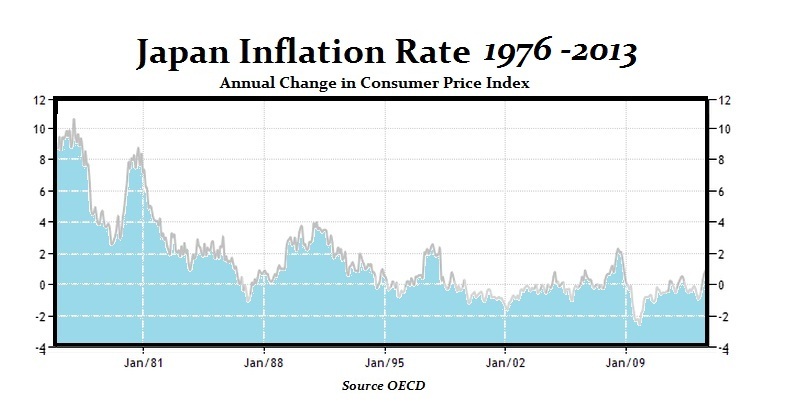 In Japan, the government fought deflation in a losing battle for more than 20 years. As deflation emerges, it becomes profitable to hoard money even if it is fiat. Increasing the value of money causes people not to borrow to spend or invest when they see no profit potential. The low rates destroys pension funds and lowers the income of the elderly forcing even them to cut back on everything. The purchasing power of the currency strangely rises regardless of its backing as consumer prices fall even when the “official” supply increases as we saw with the Fed. The price of a lunch in the financial district of Tokyo at the peak was 1,000 yen and today it has fallen to below 100. Consumer prices are now collapsing in Greece falling by 2% in October alone. This is the strongest deflation for over 50 years. Throughout the Eurozone, the official inflation rate is currently at 0.7 percent, the lowest in four years. There was a financial panic in Rome in 33AD that was caused by a cascade failure from many different aspects. Emperor Tiberius (14-37 AD) who had a reputation for being frugal in his expenditures yet unlike modern politicians never raised taxes during his reign. Suetonius tells us in Book VIII that Tiberius acted as advocate in Rome beginning his civil career in separate cases with Augustus presiding, on behalf of King Archelaus (of Cappadocia); the citizens of Tralles (Aydin, in Turkey); and the Thessalians. 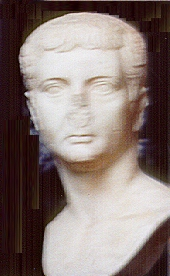 Tiberius had also undertaken two special commissions; a re-organisation of the defective grain supply, and an investigation into the slave-farms, in Italy, whose owners had acquired an evil reputation by confining lawful travellers, and also harbouring men who hid there as slaves, out of an aversion to military service. 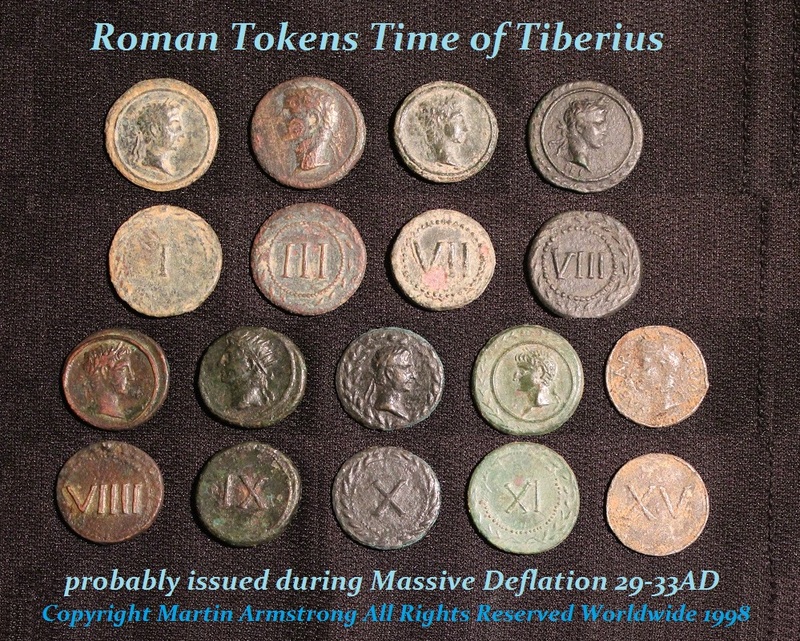 Tiberius’ coinage is rather scarce for there is not a great deal of issues. He even refused the title Augustus (‘Father of the Country’) and prevented the Senate swearing to uphold his actions, for fear of the greater shame when he was found to be undeserving of such honors. He was a complex character and the emperor who presided at that time of Jesus’ execution. Tiberius also appeared before the Senate to support pleas by the inhabitants of Laodicea, Thyatira and Chios, who requested help after a devastating earthquake on the coast of Asia Minor. Thyatira (Thyateira), is the modern Turkish city of Akhisar. It lies in the west of Turkey, south of Istanbul and almost due east of Athens. It is about 50 miles from the Mediterranean. In classical times, Thyatira stood on the border between Lydia and Mysia. It was famous for its dyeing and was a center of the indigo trade and this was a key component in the luxury trade. The foreign trade in luxury products of spices, silks, and dyeing with rare colors like purple and indigo included both product from Africa and China via the Silk Road. The Panic of 33 AD began as a contagion that spread across the entire Roman world. Where the Great Depression of the 1930s began with a banking failure in Austria, this one began with a famous bank failure of Seuthes and Son, which was located in Alexandria, Egypt. There was a loss of three cargo ships in a Red Sea storm. This was combined with a collapse in luxury products they financed from Africa for sale in Rome – ostrich feather and ivory markets in addition to a various dyes.. Virtually simultaneously, there was the collapse of the great trade house of Malchus and Co. of Tyre with branches at Antioch and Ephesus, which went bankrupt as a result of a strike among their Phoenician workmen (early unions) and the embezzlement of senior staff – the business manager. 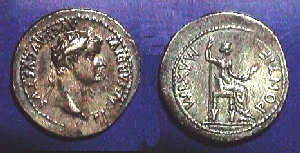 These financial failures set off a contagion that then impacted the Roman banking-house of Quintus Maximus and Lucious Vibo. As news of these problems emerged, a bank run surfaced and spread to other banking houses as confidence collapsed. Rumors spread that many banks were involved especially that of the Brothers Pittius. 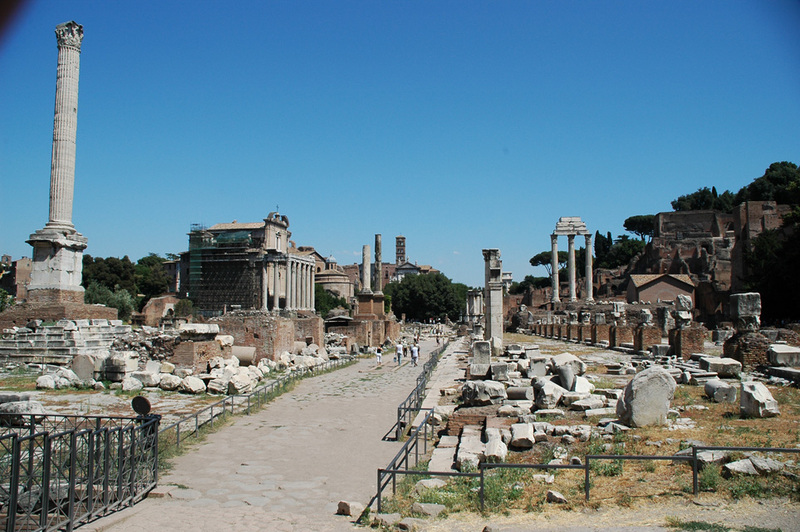 The Via Sacra was the financial center of Rome located in the Roman Forum. It was the ancient Wall Street of Rome in its day. As the financial crisis struck, this thoroughfare erupted in panic with merchants clamoring to save their businesses. The banks were all interlinked doing business with each other much as we have today even creating syndicates..
With the financial chaos rapidly spreading from bank to bank throughout the empire within days, there was also a rebellion that had erupted in Northern Gaul (France). The Romans were also great investors in emerging markets and labor costs were cheap the further you moved from the center of Rome. With large investment in emerging markets, any rebellion in these regions alone sent panic down the Via Sacra. A moratorium of investment and debt had been declared by the provincial government on account of the distributed conditions and now capital could not be withdrawn. This now set off a cascade effect on yet other banks as capital became frozen thanks to capital controls not dissimilar from current conditions in India or South East Asia during 1997 Crisis.. 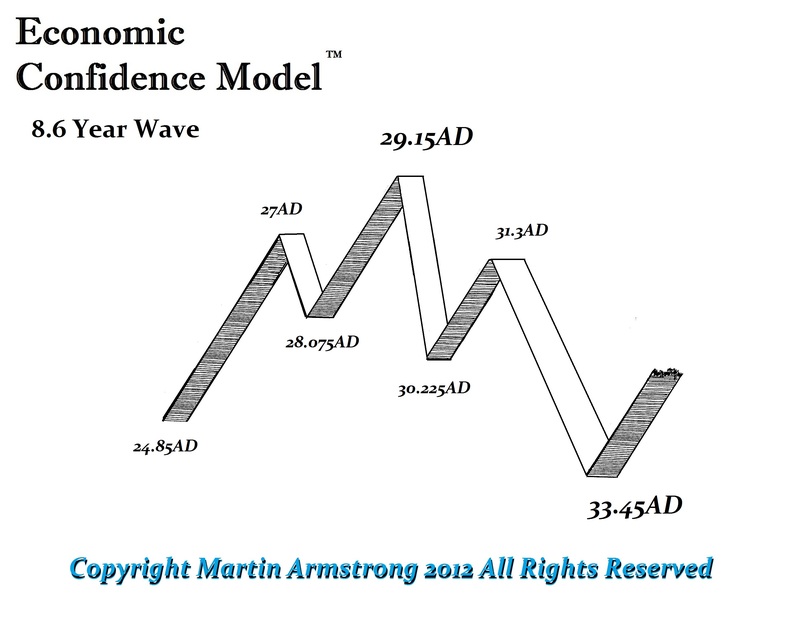 This all combined with the economic decline in agriculture had peaked in 29 AD with the Economic Confidence Model. Thus, there was a bear market in full motion in the primary economic driver – agriculture. Tiberius was confronted by a major financial crisis coming from several directions in the middle of an economic down wave. He responded requiring that one-third of every senator’s fortune be invested in Italian land to support the collapse in land values that were based on agriculture. Thus he also had a real estate crisis to confront. The senators had 18 months to make this adjustment, but by the time the period was up, many senators had failed to make the proper adjustment because prices had been still falling. This deadline occurred at the same time at the bottom of the wave in 33 AD as these additional events unfolded. Deflation was in full swing and the value of money rose sharply. Shortages of money began to emerge and we find at this time private tokens start to appear. These tokens are rare and have denominations on the reverse in Roman numerals denominated most likely in the base unit the Roman As. There was no difference in size relating to value so they were purely a representative form of money (value). During such economic contractions, we often find private script appearing due to severe shortages in money. 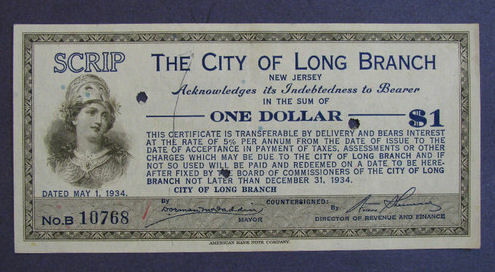 During the Great Depression in the USA, more than 200 cities issued paper currency because there was a shortage of money. 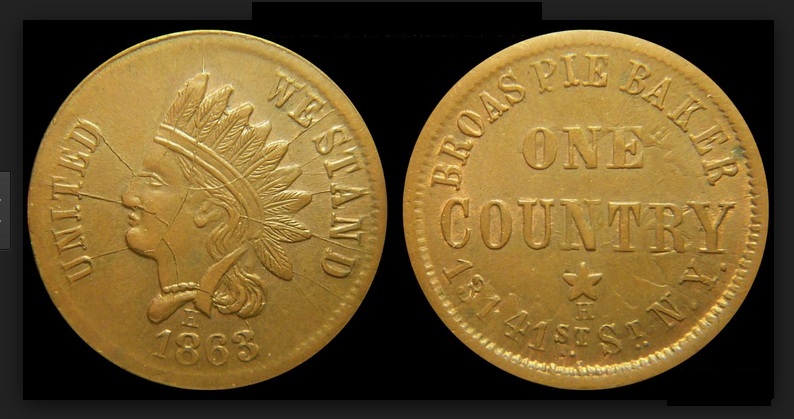 During the US Civil War there was postage currency circulating as coins advertising various companies on the reverse. 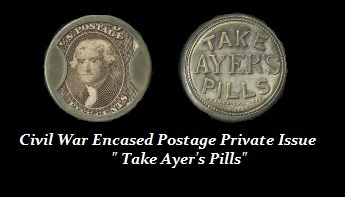 The backing is a postage stamp because of the massive shortage in coinage. We find the same thing with private tokens being issued because of the shortage of money. In Rome, Publius Spencer, who was a wealthy noblemen in Rome, requested 30 million sesterces from his banker Balbus Ollius. The bank was unable to fulfill his request and closed its doors. You can imagine the financial crisis that emerged. What if Bill Gates went to his banks and wanted a billion and the bank today said no they did not have it. The chaos that would emerge is indescribable. The banking crisis of 33 AD now spread everywhere within a matter of days. News could travel from Rome to Britain in just 7 days as established from letters found near Hadrian’s Wall dividing Britain and Scotland. During this short period, major banks in Corinth, Carthage, Lyons and Byzantium all closed unable to meet obligations. A full-scale banking crisis held the entire Roman Empire in the grips of sheer panic. The closure of banks along the Via Sacra in Rome would be the equivalent of the Wall Street announcing it closed unable to meet obligations. The banks began calling in their loans desperately trying to regain liquidity as they always do in a crisis, which fuels the deflation forcing assets to be sold in distress. This collapse in prices as debtors cannot meet the demands of their creditors creates a cascade failure. This is the heart of the deflation that cannot be prevented by increasing money supply for you cannot increase it in sufficient proportion to the collapse in asset values. This vortex of a debt implosion leads to seizures of assets with forced sales of homes and possessions sending the purchasing power of money even higher (deflation). As money becomes unavailable and its value rises daily, even at the legal limit of 12% for interest rates gave way. 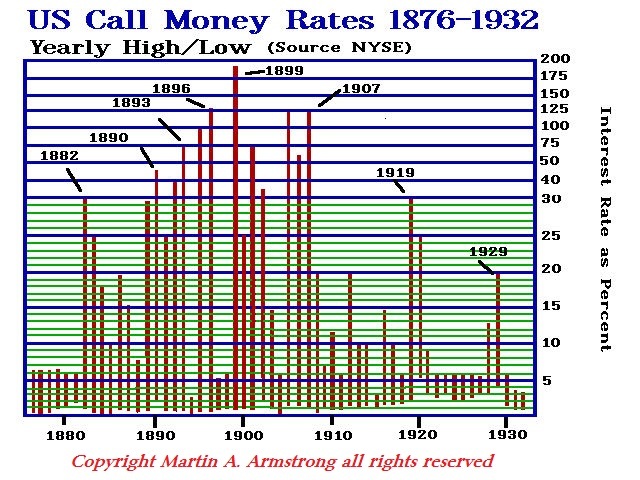 We can see the chart of call money rates during the various financial panics in the United States. Interest rates rise tremendously during such early periods of crisis as the “cost” of money rises sharply regardless of what it is at that time and as rates subside, the “value” of money then rises yet demand for loans collapses as lenders also begin to hoard their capital. As the deflation unfolds, tangible asset values collapse such as real estate and other goods as cash becomes king with few buyers. The Panic of 33 AD gripped the entire Roman World. Tiberius had retired from Rome fearful of the public perhaps because of the economic decline in real estate values in motion from the peak in the ECM – 29.15 AD. Nevertheless, as the crisis of 33 AD emerges, Tiberius sent a letter to Rome with measures to alleviate the crisis that demonstrated his keen awareness of the economy. His decrees ordering senators to invest in land were immediately suspended. Tiberius then ordered 100 million sesterces were to be taken from the imperial treasury and distributed among reliable bankers, but unlike the incompetent US Congress, the money had to be loaned to the neediest debtors. To put this in perspective, a soldier earned about 1000 sesterces at that time and comparing that to military pay today it would be more than $2 billion. Tiberius was concerned about the economy rather than the bankers who were not primary dealers as they are today capable of blackmailing government. Tiberius ordered that NO interest was to be collected for three years. He also ordered that the bankers accept security that was to be offered at double value in real property taking into consideration how much it had fallen in price by about 50%. Tiberius brilliantly enabled many people to avoid selling their estates at low prices, which the US Congress just bailed out banks with no strings attached. Tiberius actually stopped the fall in prices by stopping the forced sales and ensuring that the lack of liquidity would be halted. It is true that the weak banks never recovered from the panic. However, most eventually did resume business as usual. Tiberius’s response was direct rather than indirect as the central bankers do today that help banks at the expense of the economy. Governments wrongly assume that the banks are the cornerstone of the economy rather than the participants. They routinely sacrifice the people for the banks because they are themselves the greatest debtors within society. Tiberius did not merely increase the money supply as was Bernanke’s response of the Fed or Congress signing TARP with no strings attached. Tiberius lowered interest rates to zero for three years, but this was on outstanding loans not to create new ones with hopes of stimulating demand (Keynesian Economics). Tiberius’ response was substantially different from the quantitative easing we saw in Japan, Europe, and the USA. Lowering interest rates to zero today destroys savers, expends the revenue of banks, but does nothing to suspend the crisis in outstanding obligations. Tiberius’ approach was substantially different and above all – IT WORKED!